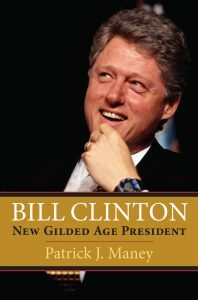 Of the original Gilded Age, historian Richard Hofstadter wrote: “There is no other period in the nation’s history when politics seems so completely dwarfed by economic changes, none in which the life of the country rests so completely in the hands of the industrial entrepreneur.” The era of William Jefferson Clinton’s ascent to the presidency was strikingly similar—nothing less, Clinton himself said, than “a paradigm shift . . . from the industrial age to an information-technology age, from the Cold War to a global society.” How Bill Clinton met the challenges of this new Gilded Age is the subject of Patrick J. Maney’s book, “Bill Clinton: New Gilded Age President,” an in-depth perspective on the 42nd president of the United States and the transformative era over which he presided. Maney’s in-depth study of Clinton goes beyond personality and politics to examine the critical issues of the day: economic and fiscal policy, business and financial deregulation, healthcare and welfare reform, and foreign affairs in a postCold War world. But at its heart is Clinton in all his guises: the first baby boomer to reach the White House; the “natural”—the most gifted politician of his generation, but one with an inexplicably careless and self-destructive streak; the “Comeback Kid,” repeatedly overcoming long odds; the survivor, frequently down but never out; and, with current Democratic presidential candidate Hillary Rodham Clinton, part of the most controversial First Couple since Franklin and Eleanor Roosevelt. Maney’s book is, in sum, the most succinct and up-to-date study of the Clinton presidency, invaluable not merely for understanding a transformative era in American history, but presidential, national, and global politics today.